Need to replace your old laptop? We're giving away an Acer C720 Chromebook (ARV: $199) to one lucky winner! This giveaway begins on February 12th and will run until February 26th at 11:59pm US Eastern time. It will be open to residents of the US only, 18+. 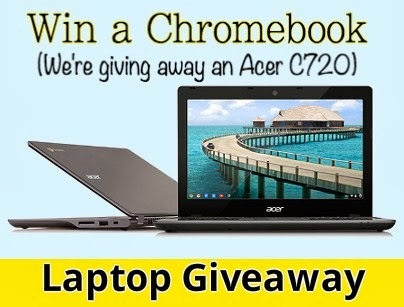 Winner may choose to receive a brand new Acer C720 Chromebook or its value's equivalent in an Amazon gift card. Use the PromoSimple form below to enter, and make sure that you take advantage of the many entries you can gain. Also, be sure to come back daily for more chances to win. Good luck! Disclosure: [Mommyyof2babies] is not responsible for prize distribution. If you have any questions or concerns, please send an email to kira@tiphero.com. All entries are optional, but if the winner task is a task that you did not complete, a second winner will be chosen. Winners will be notified via email. If a winner does not respond within 48 hours of the time when the email is sent, another winner will be chosen.